The “coffin” is made of 18-gauge steel and is described by its makers as “a high-end coffin.” It’s painted with a bacon motif and comes with a bacon-scented air freshener inside. The irony which most can immediately recognize is that, for the “bacon fan,” the overconsumption of bacon will likely expedite one’s passage into their coffin. What many may not recognize, however, are the lives and deaths of all those pigs whose bellies were cut into strips of bacon (unless they’ve adopted a pot-bellied pig or are vegetarian). This juxtaposition is relevant to how we think about other animals, especially those we embrace as family. Regarding the “bacon coffin” – the grave of the consumed pig is within the remains of the deceased person, entombed in a metal coffin with a design that refers back to the pig’s remains, and severs both from the natural world. A second business mixing funeral with meat deals with animal death more directly. 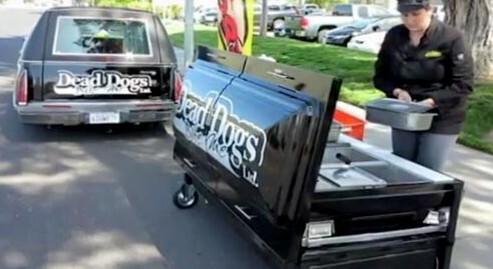 Dead Dogs Ltd. sells hot dogs from a metal coffin shuttled about in a hearse. Unlike the “bacon coffin,” this coffin is not intended for human bodies, but for the bodies of animals: it was repurposed to cook hot dogs (which commonly include pork). Some onlookers were initially confused when they saw the company name on the hearse, assuming that it was a dog cremation company. This confusion begs the question: how did ‘hot dogs’ get this name? These sausages likely originated in Germany or Austria, and there is some evidence that points to a rise in eating actual dogs in Germany in the early 20th century,[i] as well as in the U.S. in the mid to late 19th century (when hot dogs in a bun were introduced in the U.S.). [ii] The possibility of eating dog meat has long been a source of personal and social anxiety, and sausages, often an economical mix of cheaper meats, have long been subject to such speculation. While there is also anxiety about eating pork among those whose dietary laws prohibit the eating of pigs, such anxiety is likely to be about moral contamination whereas eating dog meat may be more closely akin to eating those who could have been family or friend. What fascinates me is the fact that, despite the cultural taboo of eating dogs, the name ‘hot dog’ has stuck! Another question arises: while we can readily speak of funerals and bereavement for animals regarded as ‘pets,’ is it possible to do the same for those regularly killed for human consumption? The distinctions begin to become blurred when considering individual animals, especially among those with pet pigs, goats, lambs, chickens, horses, rabbits, turkeys, etc. Since the launch of the Green Pet-Burial Society, these folk have reached out to us to describe their wonderful relationships with their companion animals, and to support the goals of the Society. Last year I had the good fortune of meeting my friends’ black pot-bellied pig – the first time I ever met a pig! Adopted several years ago, she quickly became a cherished member of the family, and I was likewise charmed by her. Extremely independent, she heartily ate the carrots and apples I offered, and let me brush her coarse hair. I’m not sure which one of us was the more grateful. Among those of us who haven’t lived with companion pigs, there may be a curiosity about the animals who are culturally significant yet unknown. Three years ago, British actor and corporate communications consultant, Richard da Costa, set out to have a deeper understanding of pigs. 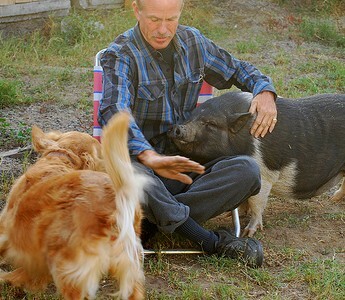 For four days he lived with 10 pigs in their concrete pen; all were being raised for slaughter. In the process, he discovered how intelligent, social, and individualistic each pig was – something scientists and those who have adopted pot-bellied pigs have long known. Coincidentally, while gathering this information this past week, I learned that it was when Jews traditionally study the 11th chapter of Leviticus, which introduces criteria and lists of animals prohibited to be eaten (such as pigs) and those which were accommodated (it also gives codes of contamination when coming into contact with dead bodies). These are part of the Jewish dietary laws (i.e., Kashruth or “keeping Kosher”), which are also observed by some Seventh Day Adventists (when foregoing their traditionally proscribed vegetarian diet), and some Eastern Christian denominations such as the Ethiopian Orthodox Tewahedo Church. Similarly, pigs are also forbidden (haram) for Muslims. Yet globally, people eat more pork than any other meat. [iv] Why some animals are allowed to be eaten while others are forbidden is fodder for another discussion. Food or family – our lives with pigs, as with many other animals, are riddled with complexity and contradictions. Support our efforts with your donation. This entry was posted in animal, Bible, burial, Coffins, Meat, pet, Pigs, thanatology, vegetarianism and tagged hot dogs, Leviticus by Eric Greene. Bookmark the permalink. Have you heard of Frankenstand? I’m sending this along to the proprietor as he’d be interested in the Dead Dogs bit. Frankenstand is a gothicky themed all vegan hot dog cart in LA. Funny how the same concept is applied in such polar opposite ways. Interesting! I just visited his website. It reminds me of the Vegan Black Metal Chef who also uses a Goth-related marketing strategy for his vegan recipes. He has over 366,000 hits on YouTube. As their meat-selling counterparts, the intention is comedy. Yet for these vegan chefs, it is also satire, since there are no actual bodies connected to their products or companies.